Click Here for the original German language article from Andreas Robertz on the Deutzlandfunk website. This repost is an edited version of the Google translation. The piece is also available as a German language podcast – To listen Click Here. Death has always played an unusually prominent role in the everyday life of Mexico. When Santa Muerte cult of Christianity and the worship of death mix.The cult takes place in Mexico more and more followers. One reason for this could be the escalating drug war in the country. A parking lot in Tultitlan, a northern suburb of Mexico City. Here is one of the largest Santa Muerte shrines in Mexico. Located directly on an arterial road is the 22-meter-high black figure and spreads her arms out. On the site there are several shrines with some life-size figures of the “Bone Lady”, as it is called in the vernacular. 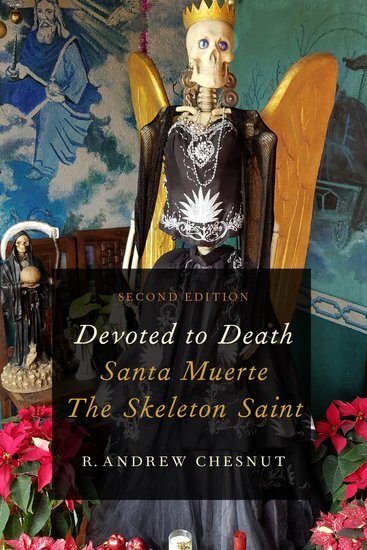 The Santa Muerte figures look like a female Grim Reaper with scythe and long robe. People bring beer and tequila, cigarettes, cooking oil, apples and sweets as offerings dar. One of these roots lies in the rich tradition of the Aztec cult of the dead, in which the faithful begged the goddess of death Mictlancihuatl with offerings to help in this world. When the Spanish conquerors Mexico in the early 16th Century subjugated, they brought with them the representation of the Grim Reaper. That death all treated equally, makes the cult today particularly attractive to those who feel pressured by the Catholic Church to the brink. Andrew Chesnut is a professor of religious history at Virginia Commonwealth University. The promise to treat everyone equally, is one of the main reasons he sees for the rapidly growing popularity of Santa Muerte. Another reason is that many felt in the increasingly dominated by drug war violence and society in Mexico without protection. The Vatican, however, shows continued hostility to Santa Muerte’s cult. Thus, the president of the Pontifical Academy of Culture, Cardinal Gianfranco Ravasi condemned the cult with unusually sharp language during a visit to Mexico. He speaks of a “Satanic drug cult”. For the speaker of the Mexican Episcopal Conference Pablo Padrazzi the popularity of Santa Muerte has two main causes: the proximity of individual Mexican criminal organizations, and the lack of education. Enriqueta Vargas, the patroness of the Santa Muerte shrine in Tultitlan, is smiling over the dispute. The Catholic Church has yet to realize that in Mexico religious freedom reigns, she says. In addition, there are just as many drug dealers with the tattooed image of the Virgin of Guadalupe as the Santa Muerte. The drug-related crime is a big problem for all of Mexico, and is not specific to Santa Muerte.